Over the last few years, people who have bought our book have had wonderful comments about not only the recipes but the journal entries. 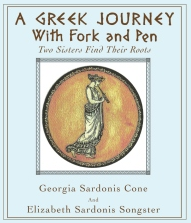 I’m still not sure if the rest of you realize this book, A Greek Journey With Fork and Pen, Two Sisters Find Their Roots, is not your typical cookbook. Recipes…yes, we have over a hundred, but filling most of the pages are our journal entries. We all four kept journals while we were there and these are what take you through our travels, every chapter a place we visited. There you will read our tales of travel, the people we met and the food we ate followed by a recipe. I am posting one of our dearest friends (Deb Maclean) reviews she put on Amazon. In fact there are numbers of fabulous reviews there and perhaps I will post them all. Nothing like getting an opinion directly from a person who has actually read it cover-to-cover! Maybe it will resonate with YOU!! “Okay, so maybe you can’t go to Greece right now. But you can do the next best thing: buy A Greek Journey with Fork and Pen. Pick one of the no-miss recipes and cook up some delicious Greek dish. Then sit and read the tales of traveling through Greece with the Sardonis sisters and their husbands. Soak up the joy of Greek life with these four delightful people who know how to cook, eat and enjoy life. The Sardonis sisters have written a real winner! First, this is a can’t-miss cookbook. You can try a recipe for the first time with guests and have no doubt that it will be delicious. Most have already become family favorites at our house. This is Greek cooking at its best – simple and delicious! Ah, but this book is so much more! The journal entries by the sisters and their husbands are warm, charming and fun. Elizabeth: So when the time comes to say good-bye there are tears mixed with laughter and promises to try to keep in touch. Dan: Woke up to the ungodly bleating of goats outside our window. And Floyd describes partying in Skopelos that includes not only drinking, toasting and smashing glasses, but jumping into the water. Thanks to our “laterally Greek sister”! Yassou and see you next time! 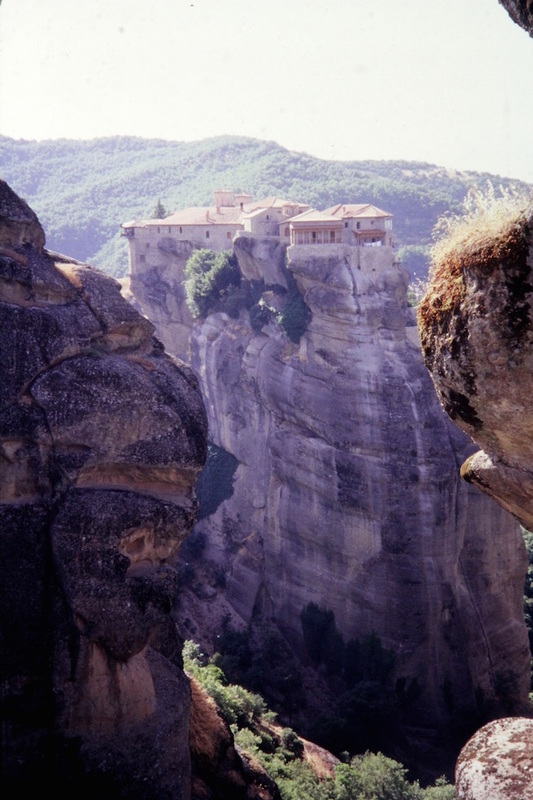 Photo by Dan Songster of one of the ginormous rocks on which one of the monestaries of Meteora is built. Deb! One more time !!! Thanks so much for being such a devoted fan of our book and using the recipes and raving about them !! Agape kai filakia !! !